The universal energy is all around us, within and without. Shahram Shiva, Shahram Shiva is a longtime Rumi expert, author, recording artist and teacher of advanced spirituality. Most successful people use visualization techniques to help manifest their goals and there are of course multitudes of books on the topic as well. But self-help books typically don’t produce results; otherwise half of the planet would be living their dreams. The universal energy is all around us, within and without. Science tells us that we are in fact stardust. We are as much a part of this universal energy as the stars, planets and nature. Although we are part of this cosmic play, unless we learn to quiet our minds from the constant chatter, distraction and noise and focus our mental vibrations through meditation, we won’t be able to fully tap into the universal energy. The ideal way to project or beam your mental desires onto the universe and to help manifest your vision is not to form it as a novel, or a short story, an email, or even a text message it’s best to say it as a one- or two-word phrase. For example if your vision is to become a professional pastry chef, no need to clutter your beam with too much info, all you need to say is “pastry chef.” The term chef in English denotes professional affiliation. So, condense your wish to one or two words and then focus on it and project it. Here’s another example. Since I live in LA, I’ll make it about wanting to become an actress. If that’s the case, don’t clutter your thoughts with too many details, such as whom you want to direct you, or for you to star with. Just say to yourself “successful actress.” Why not just “actress,” because if you just project “actress” you may end up in a community theater in a small town somewhere. OK, now let’s begin. Don’t try this if you feel sleepy or your mind isn’t fully awake. Put aside about 20 minutes and find a quiet place. Make sure you aren’t disturbed during this time. Sit upright either on a chair or on the floor. Keep a little journal next to you, whether your computer, your phone that has been put on mute or pen and paper. Start your meditation. Keep eyes closed and breath slowly. Focus on what makes you happy. Don’t force or judge the wishes and don’t place monetary limitation on them. Trust your instinct and sense which thought, profession or scenario makes you truly happy. Keep it simple. Use my one- or two-word projection technique. Think of the people around you who are negative and do not support your vision, then say to yourself “less.” Meaning you want less people like that around. Then think of the people around you who support your vision, then say to yourself “more.” From now on, keep it only positive. Place no limitation or judgment on your wishes. Now continue to repeat your vision internally as you breathe in and out with your eyes closed. After your session, type or write your thoughts and the exact nature of your vision and how you feel about it. Then focus on your vision and think about it daily. Your new clear and uncluttered focus will bring in events, people or situations that will help with your vision. Soon you’ll find ways to manifest your dream. Remember it doesn’t have to be an epic decision, so small gestures are OK too. 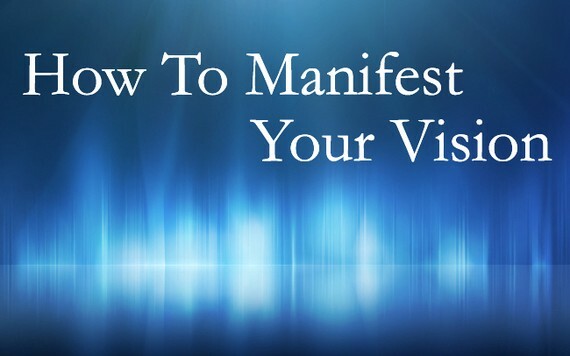 It’s important that you maintain your focus on what you want following your vision manifestation session. Make sure to repeat these sessions often or at least once a week. Feel free to comment below sharing your unique vision. Shahram Shiva is an award-winning translator and scholar of Rumi, author of several books, a performance poet, recording artist and teacher of advanced spirituality. He is known for rich and entrancing concerts and performances and captivating talks and lectures. Shahram Shiva is one of the original translators and popularizers of Rumi. Shahram Shiva's teachings are on the future of spirituality, consciousness expansion, vision manifestation, self-realization and the art of limitless living. Shahram Shiva's latest album is LOVE EVOLVE and his newest book is Rumi's Untold Story.